The best kinds of thrillers and horror films don’t have to rely on the big bad antagonist that is chasing our heroes around for actual scares, but rather they build up the tension and expel the terror through the situations they create given the circumstances no doubt involve a big bad killer or evil spirit chasing our heroes. Over the past two years we’ve received two very different, but startlingly effective shark movies that utilize this technique really well and fortunately 47 Meters Down is one of those with last summer’s The Shallows being the other. 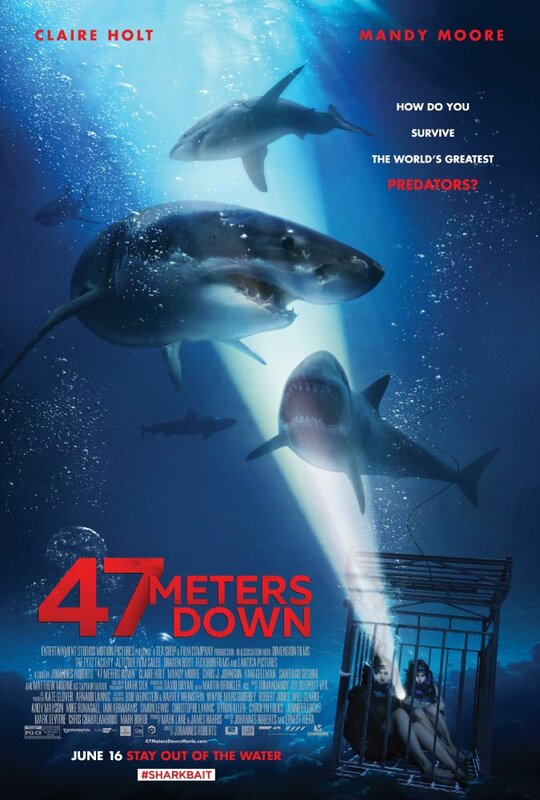 To go one step further, I’d say 47 Meters Down is the better of the two. At a lean eighty-nine minutes writer/director Johannes Roberts (The Other Side of the Door) doesn’t waste time setting things up, getting into the action, and most importantly-he doesn’t muffle that action or story with supplemental material. Instead, he executes his and the characters primary objective as successfully as one could hope in this day and age and he does so by keeping things simple. Within five minutes of the film beginning we know why our two lead characters, sisters Lisa (Mandy Moore) and Kate (Claire Holt), are vacationing together, we understand the dynamic that has existed between them in the past, and we quickly come to note their motivations for seeking out the thrills that inevitably lead them to their unfortunate predicament deep within the ocean. There is no messing around, there is hardly even any submerging us in the environment that is the coast of Spain because this isn’t the environment Roberts wants us to get comfortable with-in fact, he doesn’t want us to get comfortable at all. This brings us back around to the opening sentence which comes up only to say that the sharks are actually the least of Lisa and Kate’s worries here. Both Roberts and co-writer Ernest Riera are well-versed in utilizing the natural horrors that come with being plunged nearly 155 feet into the ocean waters and it is in such a scenario that 47 Meters Down continues to build upon the number of hurdles our characters must face if there is any chance of survival; only reminding us of the sharks when we think we can’t handle another thing hurting those chances of survival. In short, it’s kind of brilliant. Kate (Claire Holt) convinces her sister, Lisa (Mandy Moore), that going on a shark cage excursion is a good idea. Brilliant may be over-selling it a bit, sure, but in terms of a movie setting out to do something specific and accomplishing exactly that-47 Meters Down kind of nails it. That said, it’s obviously not an exceptional piece of cinema or any such thing, but it’s solid B-movie fun and I dug almost every decision it made from the beginning. For starters, how much effort and creativity you put into your title screen counts for a lot with me and it’s clear Roberts appreciates the style of it all and so from that first moment on I knew I was getting into something that was at least very aware of the kind of movie it was and desired to be. Furthermore, after being introduced to our characters and giving us what the, admittedly amateur and rather terrible, reasons are for their motivations Roberts makes his intent with this feature clear by his choice in soundtrack being a generic mainstream rock record that could have come from any number of bands in the late-90’s or early 2000’s to the general aesthetic he and cinematographer Mark Silk enlist to capture the potentially skeezy operation being run by Matthew Modine’s Captain Taylor and the two fellas Lisa and Kate meet in their search for escapism. The boat is dingy, but the people are pretty. The same is true of the locations in that they are naturally gorgeous, but are shot in such a way we see the cracks, the crevices, the rust, and the time worn elements that give us pause to just how often this boat is used (or not) or how often these waters are traveled (or not). Given a heads up about the thrills Taylor can offer (as well as the discount, considering he’s a friend) it would seem Louis (Yani Gellman) and Benjamin (Santiago Segura) are up to no good and, without going too far into spoilers, Roberts is intent to keep that suspicion going even after Louis and Benjamin take the dive themselves followed by the submersion of Lisa and Kate. While we may want to believe one thing or suspect as much because the movie does this thing to make us think certain hunches might in fact or not in fact be true the trick is we never know and I’m certainly not going to ruin anything here. This is the trick throughout as well as every time we think the more adventurous and spontaneous Kate might have a leg up on their escape something else happens that knocks them back into hopelessness. Most notable is a sequence where Lisa is asked to swim out over a ridge to retrieve a flashlight and the moment Lisa swims out over that open water I’ll be damned if I wasn’t holding my breath as well. Being consistent with what could be considered a thin premise is key. As my screening reached its half hour mark my question became how the movie would be able to sustain itself even with its short runtime, but as soon as such questions began to populate my brain the film was sure to answer them by paying off complications and little bits of information it had fed us earlier. There is of course talk of how much air Kate and Lisa have left in their tanks, but beyond that they can’t just exit the cage and swim back to the surface as not only could a shark come from anywhere at any moment, but also at that depth a quick ascension would cause the nitrogen in their tanks to create nitrogen bubbles in their brain which would kill them. To avoid such a sneakily gruesome fate the sisters would have to swim to the surface at a slow pace so as to allow the nitrogen to decompress, but having to stop in five minute increments isn’t exactly ideal when the boat hovering above you has intentionally been working to attract hungry sharks. The point being, the film naturally and intelligently continues to up the stakes and that is what matters most in a movie like this-that the audience first buys into the scenario which is where 47 Meters Down is a little flimsy, but is general enough that we buy into it without too much hesitation, with the setbacks continuing to be credible enough that they don’t feel forced in a way that they’re only present to extend the plot to feature length. This would seem to be a movie like 47 Meters Down’s biggest obstacle, but one of the best surprises coming out of this film in particular was that it more or less glides over as much in an effortless fashion. To reiterate this point, I always tend to judge a scary movie or thriller by how bad it makes me want to yell at the characters on screen due to their lack of good decision making skills which can be fun in its own right, but mostly the verdict comes down as frustrating. 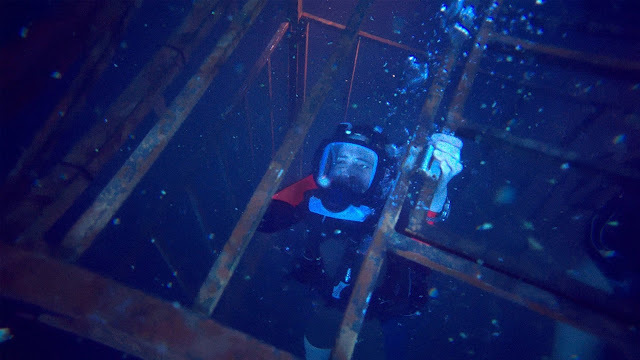 In 47 Meters Down it is clear both Lisa and Kate are competent and intelligent adults that fall into these unfortunate circumstances due only to the fact they wanted to do something exciting and spontaneous. Encouraging and reassuring to the viewer is the fact Lisa and Claire each try everything you would want them to do with only the fact the majority of such efforts fail making said experiences all the more frightening. Lisa is trapped in a shark cage well below the water's surface waiting in hopes of a rescue. And so, this brings around to the necessary discussion of how Moore and Holt do in conveying all of these emotions while having little else to play off of besides each other and the dimly lit depths of the ocean. While the aforementioned set-up, which includes Moore’s Lisa being upset and feeling like a failure because her boyfriend broke up with her for being too boring, is executed in a somewhat laughable fashion Moore is enough of a pro to know how far to push the somewhat pathetic nature her character displays to the background. On the other side of things, Holt’s Kate is the exact opposite as someone who has never settled down, but is the type who it seems likely was on a different vacation with a different friend the week before because she’s great at meeting people, making friends, and having a good time, but terrible at sustaining any type of stability in her life. These characteristics are reiterated through the way each of them interact with the guys they meet, but more so in how quick Kate agrees to the idea of going down in a shark cage and how hesitant and concerned Lisa is about every factor surrounding the situation. Both Moore and Holt give compelling performances though as we're totally invested in their plight and, more impressively, remain that way until the end. Even if the script leads us to believe in one instance that it gives the inherently timid sister more reason to think her outlook on life was more appropriate than her sister who would presumably be viewed as being punished for her more optimistic and open view on life thus scaring her into an existence of fear and seclusion. While I'm not sure 47 Meters Down is the type of film that necessarily wants to make its audience think about anything or even considers an idea to craft its main narrative around there is a sliver of a moral that tells the audience member not to do something just to prove you're someone else to someone else. This would no doubt be the path Roberts would take were he questioned about the reasoning's behind his character's motivations and personalities-that we have to ultimately embrace our fears and that despite the fact they'll test us they'll eventually make us stronger-it would seem the actual lesson is the conservative, homely sister was right and we should all remain as guarded as possible. People don't go to movies like this for life lessons though, and thankfully 47 Meters Down doesn't make a point to dwell on its half-baked ideas, but rather on the climactic moments it earns and the brutality that is served up in the final moments paving the way for a surprising, fairly tragic, but satisfying close to a surprisingly satisfying experience.